“Forest industries are incredibly important to the economic and social fabric of North-West Tasmania, which is why AFPA is coming forward with specific policy ‘Asks’ for all candidates,” Chief Executive Officer of AFPA, Mr Ross Hampton said. “There are six major building blocks in our plan which would allow our forest Industries to surge, growing jobs and ensuring their future viability. “More than 10,000 Tasmanians are employed directly and indirectly by our industries and they’re worth $574 million to the Tasmanian economy. “Under this plan we could add another 150 jobs at least to the North-West and many more indirectly,” Mr Hampton said. • Drive the planting of up to 14,000 hectares of new plantations, by removing the red tape locking forestry out of participating in federal carbon storing policy and commit to $2 million for a Timber Plantation Development Project. • No more lock-ups of native timber supply areas. • Back in bioenergy with a $2 million bioenergy commercialisation node in Braddon. • Ensure the future of the National Institute of Forest Products Innovation in Northern Tasmania with another $4 million research and development injection. • Provide $1 million for a Forest Industries Skills and Training Plan for our future workforce. • Get cracking on much needed infrastructure upgrades such as key roads and bridges with a $1 million study to identify priorities and bottlenecks. 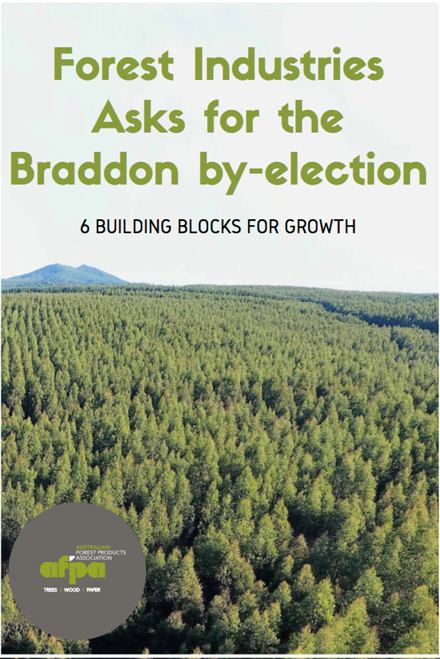 “Forest Industries are integral to Braddon, and the candidates and political parties contesting the by-election need to offer the recognition and support they deserve. We’ll be marking candidates and political parties on their commitments and producing a public scorecard prior to the by-election,” Mr Hampton said.